Beautiful, contemporary Judaica Kiddush cup and saucer set for Shabbos and Yomim Tovim, made of anodized aluminum in a majestic shade of gold. Its unique, fashionable design adds a pop of color and modernity to to your holiday festivities. This beautiful Kiddush cup and saucer set is a striking addition to your Shabbat or Yom Tov table. 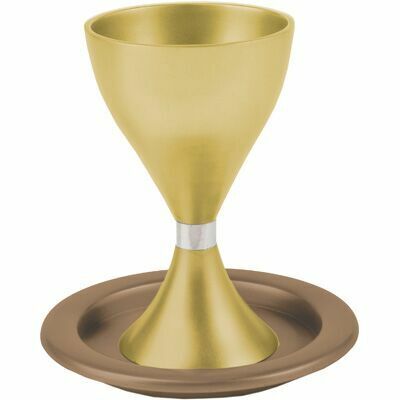 Made of gold colored brushed anodized aluminum, the goblet has a distinctive, hourglass shaped design. The stem is decorated with a delicately contrasting silver band, and the base rests sturdily upon the accompanying saucer. Great for gift-giving, or use at home. Either way, Shabbat Shalom! The Kiddush prayers are recited every weekly Sabbath, and on Jewish holidays throughout the year, like Rosh Hashana, Sukkot, and Pesach. The traditional Shabbat Kiddush prayers consist of blessings commemorating the Israelites’ exodus from Egypt, the creation of the world, and the special designation G-d gave the seventh day of each week, namely the Day of Rest, when Jewish people abstain from mundane work. The blessings are recited over a glass of wine or grape juice - although any glass will do, it is always praiseworthy to beautify the ritual with a decorative Judaica goblet such as this one.